How to ensure quick success with an avalanche transceiver? Carefully read the user’s manual. Familiarize yourself with the use of the ARVA transceiver before you enter the backcountry and practice in the field. Take an avalanche safety course. Do not hesitate to ask a mountain professional or a training center (ENSA, ANENA, CAF, FFME, FFS). 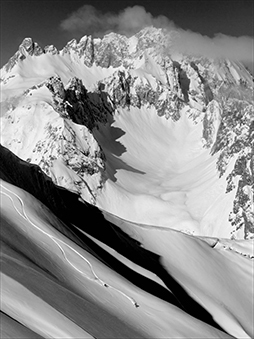 Many ski resorts are equipped with an avalanche training park. Ask the local tourist office or ski patrol (training parks are compatible with all the transceivers on the market). Does the battery power influence the unit performance? For analog devices, the range is directly linked to battery power. Read the user’s manual carefully. For digital devices, the emitting power level and search range is independent of battery power until a battery reaches below a battery level recommended by the manufacturer. When your batteries reach below the lower limit, your beacon warns you with a visual and sound indication. On all our beacons, we warranty 100% emitting power until your batteries drop below 20%. IMPORTANT: do not use rechargeable batteries, because they have a sudden capacity loss. We recommend alkaline batteries that are provided with the unit (we recommend you carry 4 spare batteries). Is the indicated number of buried victims reliable? If there are more than 2 victims, consider that the calculated number of burials displayed is uncertain as long as all the found devices are not switched off. During the search, signals may overlap or some interference may disturb the signals. This is why, the “multiple burials” icon does not appear always immediately. It may even happen that this icon does not appear at all. This is why, you must check the entire avalanche path. Are all brands of transceivers compatible? Yes all transceiver devices that operate on a frequency of 457 kHz are compatible. Why are the numbers only an indication of distance and not real meters? The signal wave is not a straight line. It is a flux line, travelling in a similar way to the magnetic forces of the earth. The device calculates the size of this wave. Furthermore, the emitting/receiving frequency is 457 kHz +/- 100 Hz. 1ST antenna: allows having a large search range. The purely analog devices have only this antenna. 2ND antenna: allows for an indication of the direction and makes the secondary search quicker. Does my transceiver require an update? To date, the only transceivers that have software updates are the Axis, Link, Pro W, and Axio. To update the software, please contact us by filling out the form available HERE. When should I send in my transceiver for inspection / recalibration and how should I go about doing it? We recommend having your transceiver inspected every year if you are a professional, otherwise every three years. You can go through your regular shop or contact us directly. We recommend having this done at the end of the winter season, since it takes less time inspect during the summer months than at the beginning of the ski season. How to deal with the interferences? In order to reduce the risk of signal deterioration, we recommend that you keep your transceiver as far as possible from sources of electrical and electromagnetic activity. IN SEARCH MODE : Move all metallic and electronic devices at least 50 cm away from your transceiver. During an active search, we recommended turning off all devices except analog radio – headlamp without dimmer – watch without a radio function – backup devices in the event of a secondary avalanche. MEANS OF COMMUNICATION : We recommend turning off all digital telephones and radios during the active search phase. All calls should be made at least 25 cm away from the individuals conducting the active search. IN TRANSMIT MODE : Move all metallic and electronic devices at least 20 cm away from your transceiver. What is the difference between an analog and a digital device? With an analog unit, the search is based on sound. The receiving power is generally more important with an analog device. But the searcher needs a great deal of training. A digital device is easier to use. The direction and distance indicators lead to the victim. Can I take an ARVA Reactor avalanche airbag with me on an airplane? Yes, it is possible to travel with an ARVA Reactor avalanche airbag. However, you need to take a few precautions. Read through our detailed recommendations and guidelines by clicking HERE. Is the airbag system interchangeable? The airbag system inside an ARVA Reactor avalanche airbag backpack is the same for every pack model, size, and volume. You can therefore transfer the airbag system from one ARVA Reactor avalanche airbag backpack to another. This allows you to easily change pack volume or to replace a worn out pack without having to purchase a full airbag system. The changeover takes about 15 minutes; detailed instructions are included in the user manual. ARVA Reactor avalanche airbag backpacks without the airbag system are available for purchase. The ARVA Reactor airbag system is only compatible with ARVA Reactor backpacks. Is it possible to practice pulling the trigger handle on an ARVA Reactor avalanche airbag backpack? Removing the compressed air canister in the Reactor airbag system allows you to practice pulling the trigger handle on your avalanche airbag backpack and to become more familiar with the technique to use in the event you are caught in an avalanche. The airbags will not inflate, but the force required to pull the trigger is the same as in real-life conditions. After practicing pulling the trigger without the canister, remember to rearm the system using the reactivation key (sold with the pack) before screwing the canister back into place. What should I do after triggering my ARVA Reactor avalanche airbag backpack? Once the airbags have been deployed and inflated, there are several steps to follow before your pack will be ready to use again. Start by unscrewing and removing the empty canister. Then deflate the airbags and fold them back into the pack. In most cases, you will not need to rearm the trigger mechanism as you required when practicing. We still recommend that you check the position of the activation indicator before screwing on the new canister. If, when triggered, you pull on the trigger handle a second time, there is a chance that the mechanism will not rearm itself. Take the time to inspect the trigger mechanism and handle before weighing and screwing in a new canister. For a video tutorial, click HERE. How should I store my pack during the summer? During any long periods of time where you do not use your avalanche airbag backpack, make sure that you store it in a dry, cool place away from direct sunlight. You can leave the canister in the system; this will help to avoid any potential contaminants entering the system and will protect the piston needle from coming into contact with anything else. When you plan to use the pack again, you will need to remove the canister to check its weight and compare it to the weight indicated on the side label. Before screwing the canister back into the system, check the activation indicator to make sure that the system is rearmed. Do I need to send in my ARVA Reactor avalanche airbag backpack for maintenance? The Reactor is a piece of safety gear that needs to be carefully checked and maintained to function properly. The maintenance procedure is detailed in the user manual (Point 8) available HERE. In addition, if you would rather not handle it yourself, we offer maintenance and repair services. To reduce the time it takes to inspect and maintain your pack, we recommend sending it to us in the summertime. For instructions on the procedure to follow, click HERE. Can I switch the trigger handle from one shoulder strap to the other? All ARVA Reactor avalanche airbag backpacks are delivered with the trigger handle positioned on the left shoulder strap to be pulled with the right hand. If you are left handed and you feel more comfortable pulling the trigger handle with your left hand, you can move it to the right shoulder strap. Unhook the trigger handle attachment on the shoulder strap, undo the Velcro keeping everything in place, and then place the entire cable-handle unit on the other shoulder strap. Make sure that you do not pass the cable above the airbag. Next, hook the trigger handle attachment onto the right shoulder strap. Can I use a canister from another brand? We recommended that you only use ARVA canisters. We make our own canisters to be able to inspect them during the manufacturing process and ensure a high level of quality. In addition, while some canisters from other brands may seem to work, they have certain technical differences that make them incompatible with the Reactor system. I have an empty canister. How can I get it refilled? After triggering your Reactor system, you can exchange your empty canister for a full canister at any partner shop. A canister exchange will cost you around 20€. If you triggered your Reactor system because you were caught in an avalanche, contact us so that we can perform a full diagnostic of your pack/system/canister.